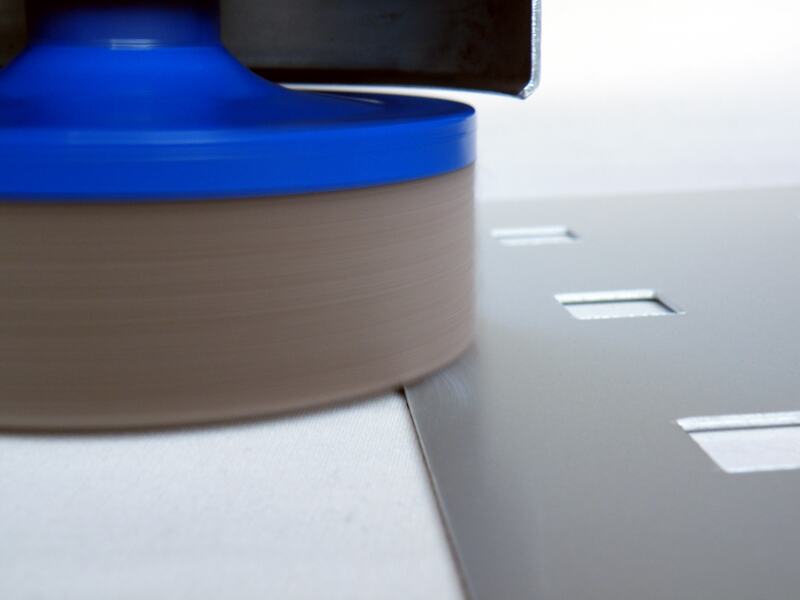 The deburring discs of the FAPI-M14 series are the ideal tool of hand operated deburring. The integrated M14 thread can be adjusted to regulated angle grinders and are especially fit for smaller and medium series, in which the purchase of an automatic deburring machine is not worthwhile. We would be pleased to advise you on which deburring discs can be used in your processing, in order to attain top process results. Das M14-Gewinde ermöglicht dem Anwender eine einfache Montage der Entgratschleifteller FAPI-M14 auf dem Winkelschleifer. To the selection of various densities, facing lengths, types of abrasive cloth and abrasive fleece, it is possible to have a decisive influence over the deburring process. The optimum design of the deburring disc FAPI-M14 can be determined based on the following process parameters: the material being processed, material thickness and the desired surface quality or the desired surface roughness. The rougher the chosen grain of the deburring disc FAPI-M14, the stronger the edge rounding on the workpiece would be. The common problem of inconsistent rounding/chamfering of sheet edges when deburring manually with sanding discs is entirely negated with the new FAPI-M14 deburring grinding wheel. It is also easy to debur longer edges as well as cut-outs and drill holes – without the user needing to apply excessive force. 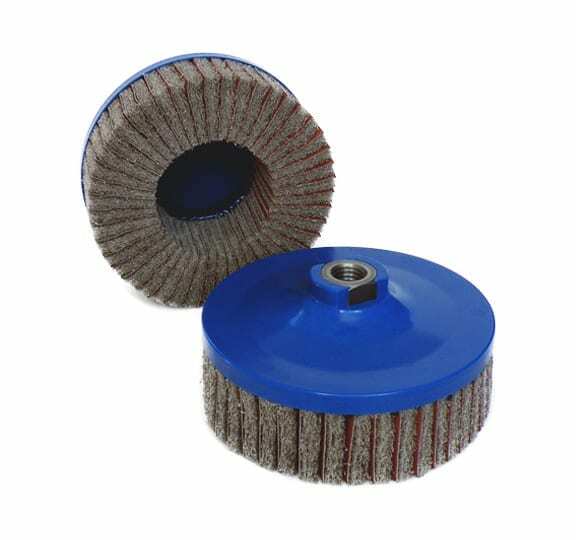 The deburring disc FAPI-M14 has abrasive cloth lamellae on the front side, which are supported by abrasive fleece lamellae. By special adjusting the lamellae it is possible to produce the deburring disc FAPI-M14 individually according to the respective processing. In particular in the case of small and medium production series this can be removed with the aid of the deburring disc FAPI-M14. This manual deburring or edge rounding grinding process with sheet metal can be carried out quickly and easily with any angle grinder. 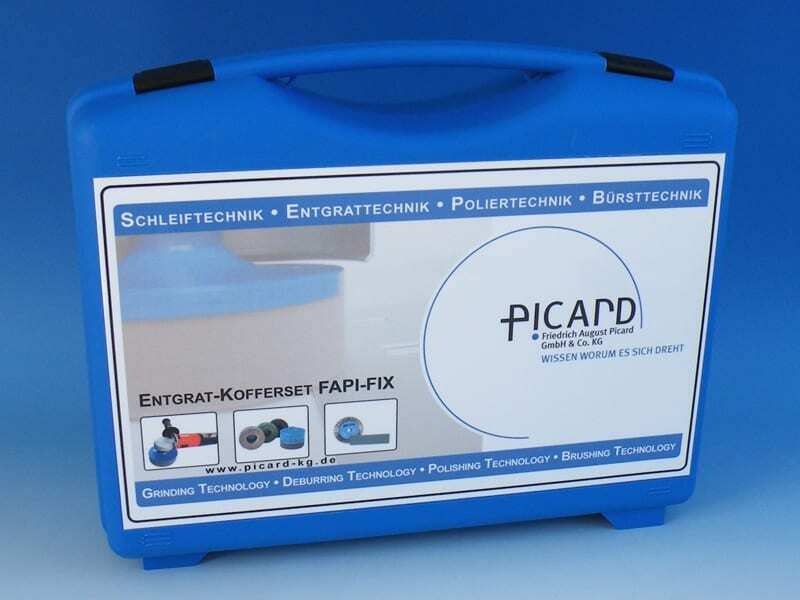 Especially for this we offer the deburring case set FAPI-FIX! In addition to the angle grinder FAPI-UPC-2R, up to 5 different deburring discs FAPI-M14, which can be individually selected by you, are assembled in a hard shell case for mobile use. For further information please click here!